Robert Ferdinand Wagner I (June 8, 1877 – May 4, 1953) was a German American politician. He was a Democratic U.S. Senator from New York from 1927 to 1949. Born in Prussia, Wagner migrated with his family to the United States in 1885. After graduating from New York Law School, Wagner won election to the New York State Legislature, eventually becoming the Democratic leader of the state senate. Working closely with fellow New York City Democrat Al Smith, Wagner and Smith embraced reform, especially to the benefit of their core constituency, the working class. They built a coalition for these reforms that embraced unions, social workers, some businessmen, and numerous middle-class activists and civic reform organizations across the state. Wagner left the senate in 1918, and served as a justice of the New York Supreme Court until his election to the Senate in 1926. As Senator, Wagner was a leader of the New Deal Coalition putting special emphasis on supporting the labor movement. He was a close associate and strong supporter of President Franklin D. Roosevelt. He sponsored three major laws: the National Labor Relations Act of 1935, the Social Security Act of 1935, and the Housing Act of 1937. Wagner resigned from the Senate in 1949 due to ill health, and died in 1953. His son Robert F. Wagner Jr. was mayor of New York from 1954 through 1965. He was born in Nastätten, then in the Province Hesse-Nassau, Kingdom of Prussia, German Empire (now in Rhein-Lahn-Kreis, Rhineland-Palatinate, Federal Republic of Germany), and immigrated with his parents to the United States in 1885. His family settled in New York City's Yorkville neighborhood, and Wagner attended the public schools. His father was a janitor. He graduated from the College of the City of New York (now named City College) in 1898 where he was a brother of Phi Sigma Kappa fraternity and from New York Law School in 1900. He was admitted to the bar in 1900. He was raised as a Lutheran, but he became a Methodist in his college years and taught Sunday school; he converted to Roman Catholicism in 1946. He was a member of the New York State Assembly in 1905 (New York Co., 30th D.), 1907 and 1908 (both New York Co., 22nd D.). He was a member of the New York State Senate (16th D.) from 1909 to 1918, sitting in the 132nd, 133rd, 134th, 135th, 136th, 137th, 138th, 139th, 140th and 141st New York State Legislatures. He was President pro tempore of the New York State Senate from 1911 to 1914, and became Acting Lieutenant Governor of New York after the impeachment of Governor William Sulzer, and the succession of Lt. Gov. Martin H. Glynn to the governorship. In 1914, while Wagner remained President pro tem, John F. Murtaugh was chosen Majority Leader of the State Senate. This was the only time before 2009 that the two offices were not held by the same person. After the Democrats lost their Senate majority, Wagner was Senate Minority Leader from January 1915 until he retired in 1918. In the aftermath of the Triangle Shirtwaist Factory fire, he was Chairman of the State Factory Investigating Committee (1911–1915). His Vice Chairman was fellow Tammany Hall politician, Al Smith. They held a series of widely publicized investigations around the state, interviewing 222 witnesses and taking 3500 pages of testimony. They started with the issue of fire safety and moved on to broader issues of the risks of injury in the factory environment. Their findings led to thirty-eight new laws regulating labor in New York state, and gave each of them a reputation as leading progressive reformers working on behalf of the working class. In the process, they changed Tammany's reputation from mere corruption to progressive endeavors to help the workers. Wagner was a delegate to the New York State Constitutional Conventions of 1915 and 1938, and a justice of the New York Supreme Court from 1919 to 1926. Wagner was elected as a Democrat to the United States Senate in 1926, and reelected in 1932, 1938 and 1944. He resigned on June 28, 1949, due to ill health. He was unable to attend any sessions of the 80th or 81st Congress from 1947 to 1949 because of a heart ailment. Wagner was the Chairman of the Committee on Patents in the 73rd Congress, of the Committee on Public Lands and Surveys in the 73rd and 74th Congresses, and of the Committee on Banking and Currency in the 75th through 79th Congresses. He was a delegate to the United Nations Monetary and Financial Conference in Bretton Woods, New Hampshire in 1944. Wagner, who had known the future President when they were in the New York state legislature together, was a member of Franklin Delano Roosevelt's Brain Trust. He was very involved in labor issues, fought for legal protection and rights for workers, and was a leader in crafting the New Deal. a veteran Liberal Tammany statesman, author of the United States labour code and devotee of the New Deal who is respected by the White House for his political acumen within his own State no less than for his political connexions. Greatest champion of the Liberal cause in the United States Senate since [George W.] Norris. A typical anti-Nazi German Democrat who has supported all the Administration measures, being usually well in advance of them. His most important legislative achievements include the National Industrial Recovery Act in 1933 and the Wagner-Steagall Housing Act of 1937. 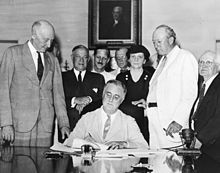 After the Supreme Court ruled the National Industrial Recovery Act and the National Recovery Administration unconstitutional, Wagner helped pass the National Labor Relations Act (also known as the Wagner Act) in 1935, a similar but much more expansive bill. The National Labor Relations Act, perhaps Wagner's greatest achievement, was a seminal event in the history of organized labor in the United States. It created the National Labor Relations Board, which mediated disputes between unions and corporations, and greatly expanded the rights of workers by banning many "unfair labor practices" and guaranteeing all workers the right to form a union. He also introduced the Railway Pension Law, and cosponsored the Wagner-O'Day Act, the predecessor to the Javits-Wagner-O'Day Act. Wagner was instrumental in writing the Social Security Act, and originally introduced it in the United States Senate. The Wagner-Hatfield amendment to the Communications Act of 1934, aimed at turning over twenty-five percent of all radio channels to non-profit radio broadcasters, did not pass. He also co-sponsored with Rep. Edith Rogers (R-Mass.) the Wagner-Rogers Bill to admit 20,000 Jewish refugees under the age of 14 to the United States from Nazi Germany, but the bill was rejected by the United States Congress in February 1939. Wagner and Edward P. Costigan sponsored a federal anti-Lynching law. In 1935 attempts were made to persuade President Franklin D. Roosevelt to support the Costigan-Wagner Bill. However, Roosevelt refused to support the bill, not wanting to alienate Southern Democrats in Congress and lose their support for New Deal programs. There were 18 lynchings of blacks in the South in 1935, but after the threat of federal legislation the number fell to eight in 1936, and to two in 1939. On June 28, 1949, Wagner resigned from the U.S. Senate, due to ill health; John Foster Dulles was appointed by Governor Thomas E. Dewey on July 7, 1949, to temporarily fill the vacancy. In 1908, Wagner married Margaret Marie McTague, who died in 1919. They had one son. In 1927 he got the first honorary citizenship of Nastaetten, his town of birth. In the 1930s, Wagner dated Marguerite Young. He died on May 4, 1953, in New York City, and was interred in Calvary Cemetery, Queens. His son Robert F. Wagner Jr. was Mayor of New York City from 1954 to 1965. On September 14, 2004, a portrait of Wagner, along with one of Senator Arthur H. Vandenberg, was unveiled in the Senate Reception Room. The new portraits joined a group of distinguished former Senators, including Henry Clay, Daniel Webster, John C. Calhoun, Robert M. La Follette Sr., and Robert A. Taft. Portraits of this group of Senators, known as the "Famous Five", were unveiled on March 12, 1959. The public middle school located at 220 East 76th Street in New York City is named after him. The former Wagner Hall on the campus of the City College of New York is named for him. Wikimedia Commons has media related to Robert F. Wagner (Senator). ^ "Triangle Shirtwaist Factory Fire (1911)". New York Times. March 11, 2011. ^ Zernike, Kate (December 14, 2006). "Stricken Senate Democrat Undergoes Surgery". New York Times. Retrieved February 26, 2012. ^ Hachey, Thomas E. (Winter 1973–1974). "American Profiles on Capitol Hill: A Confidential Study for the British Foreign Office in 1943" (PDF). Wisconsin Magazine of History. 57 (2): 141–153. JSTOR 4634869. Archived from the original (PDF) on October 21, 2013. ^ "U.S. Department of Labor - Labor Hall of Fame - Robert F. Wagner". Archived from the original on March 1, 2012. Retrieved February 26, 2012. ^ Ritchie, Donald A. (2005). Reporting from Washington: The History of the Washington Press Corps. Oxford University Press. ISBN 978-0-19-517861-6. Retrieved December 18, 2016. United States Congress. "Robert F. Wagner (id: W000021)". Biographical Directory of the United States Congress.